In this section of the website my intention is to focus on my availability for other commissions outside of Public art including fees based art practice. The Call of the running tide was a private commission for a client's architecturally designed house The Edge on Flagstaff Hill in Port Douglas. The art piece was specifically designed for the large entrance wall of the house, 7m long and 5m high. The house was awarded the Eddie Oribin Award for Building of the year in Queensland, June 2015. My brief was to work site specifically with the building and its position overlooking Port Douglas Beach, Dickson's inlet and the near ranges (180 degree views). 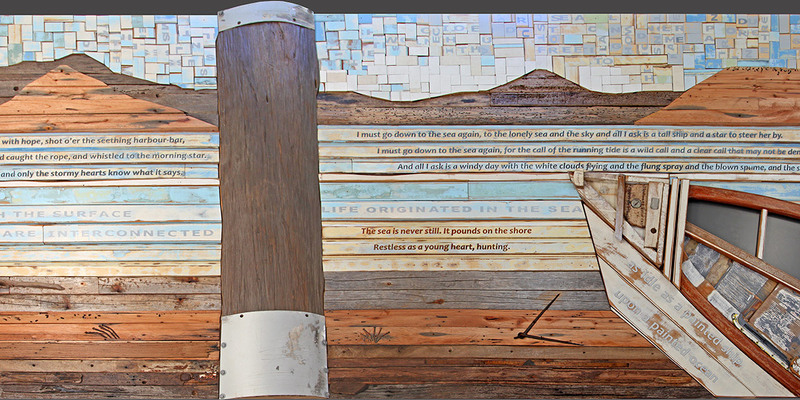 I chose to use recycled material for the entire work, including driftwood (from man made objects) and chamfer boards from old Queenslanders. The materials were complementary to those used in the building adding a soft note to the predominant use of concrete and steel. Using chamfer boards from Old Queenslanders added an ironical touch as a comment on old and new architecture and the process of building, (especially as this building offered a unique contemporary architectural comment on the notion of 'Beach House'). The work is both a comment on the position of the house overlooking the sea and the clients and my own long involvement with the sea on boats and sailing vessels. 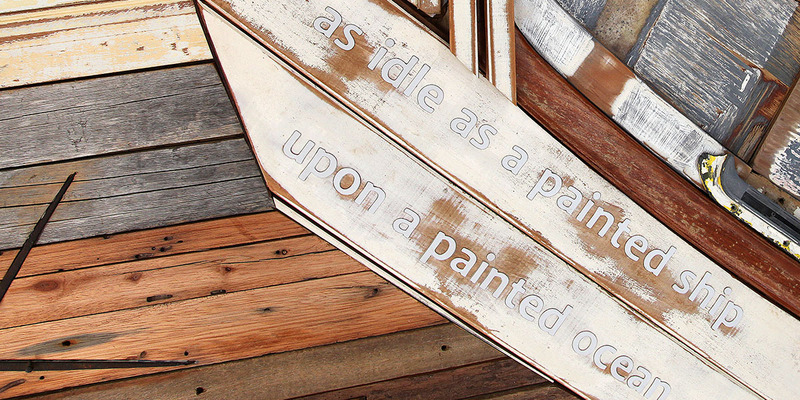 It is also evocative of possibilities with its theme of maritime adventure. 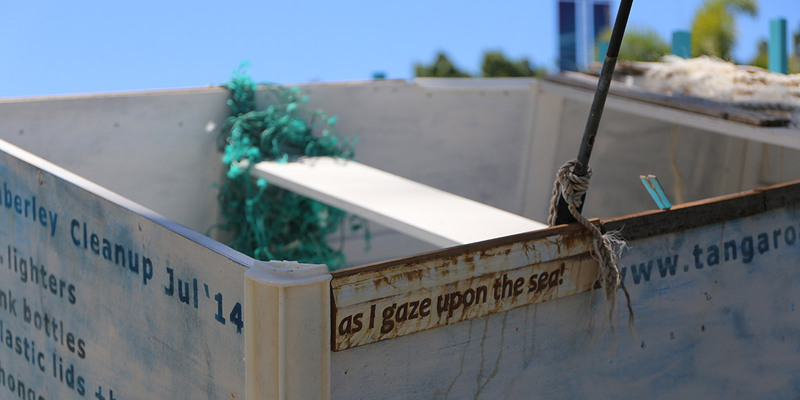 The work is lyrical, a play between art/assemblage, poetry and philosophy. 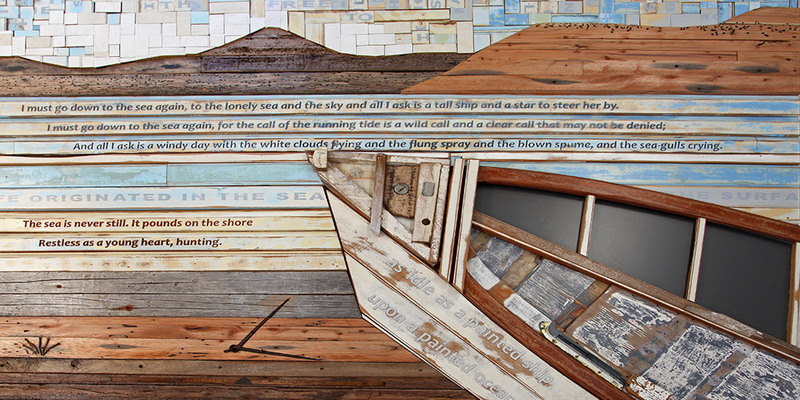 It also speaks of the visual poetry created by sun and water on the driftwood and the interplay of overlaid paint from the various re-paintings of the chamfer boards. 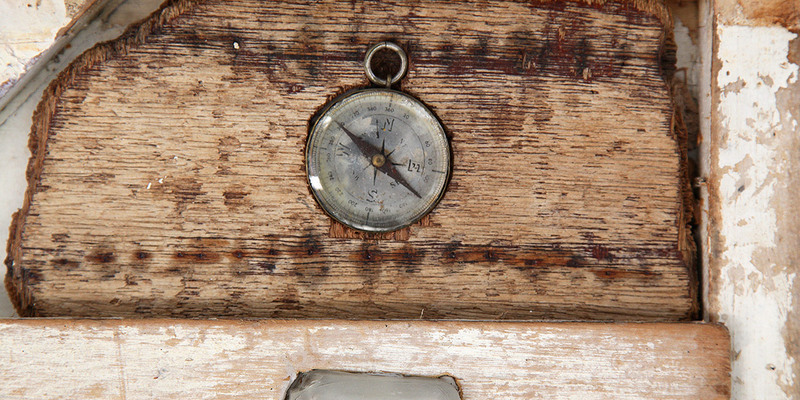 There is a sense of a story with each found object. The driftwood is deposited by each tide, the in-running tide, where deposits of marine debris arrive mostly from the mainland and the 'running' tides when boats leave for new destinations. 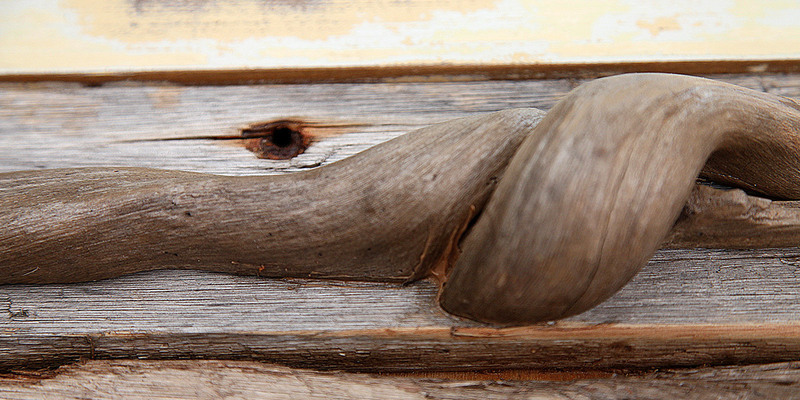 When slicing the driftwood into a uniform thickness to form the work, the perfume of the various timbers permeated the air: spotted gum, red cedar, pine, yellow cyrus etc. 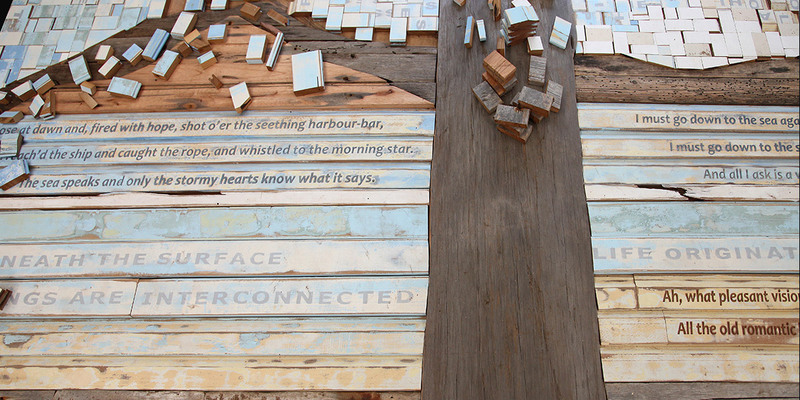 a further sensory addition to the visual interest etched into the driftwood by sun, sea creatures and seawater. The sea poetry is selected from old classics, while the philosophical thoughts (most of which are cut up and embedded in the sky) are my own or from my collections. The work is semi-abstract creation of a seascape with sky, mountains (loosely drawn from the horizon line you can see from the house), sea, sand, boat & pylon. 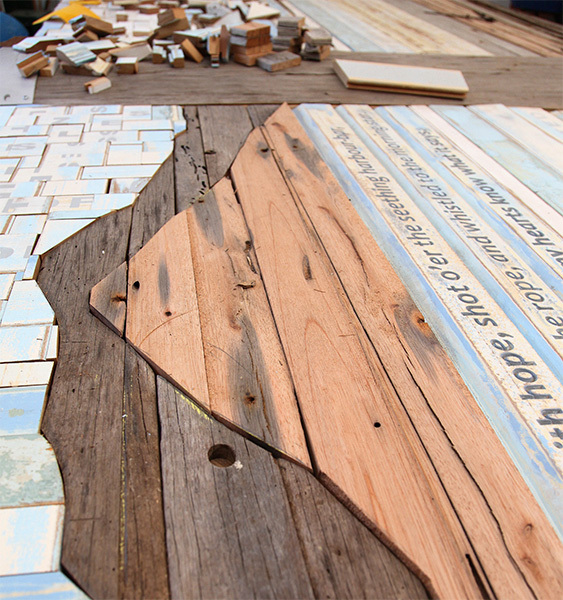 5m x 5m x 2.4 m H.
Washed Ashore is literally created from jetsam and flotsam collected mainly from the North Queensland coastline by the Marine Debris Collection organization; Tangaroa Blue. 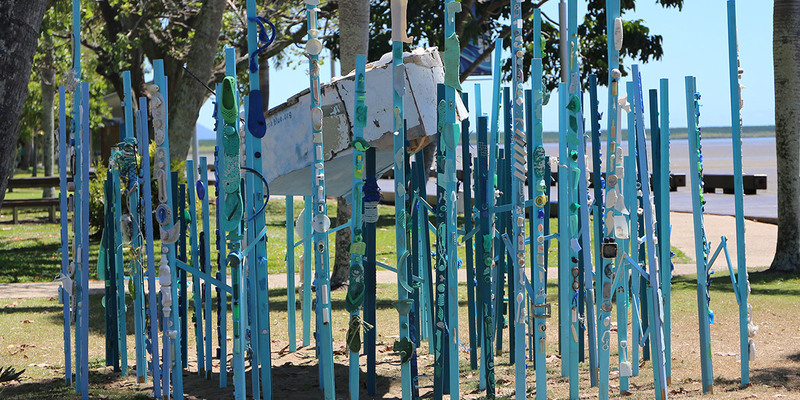 The work was commissioned as part of the 2014 Cairns Festival of the arts and installed as part of 'Esplanart'; on the esplanade in Cairns for the duration of the Cairns Festival 2014 and the G20 summit. 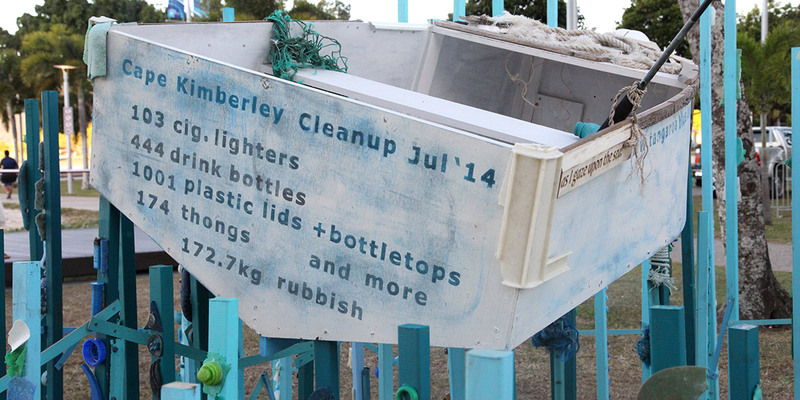 Tangaroa Blue is a Marine Debris initiative, run mostly by volunteers and the brainchild of several people including Heidi Taylor, the director, who lives in Port Douglas. The aim of the organization is to remove and recycle debris. 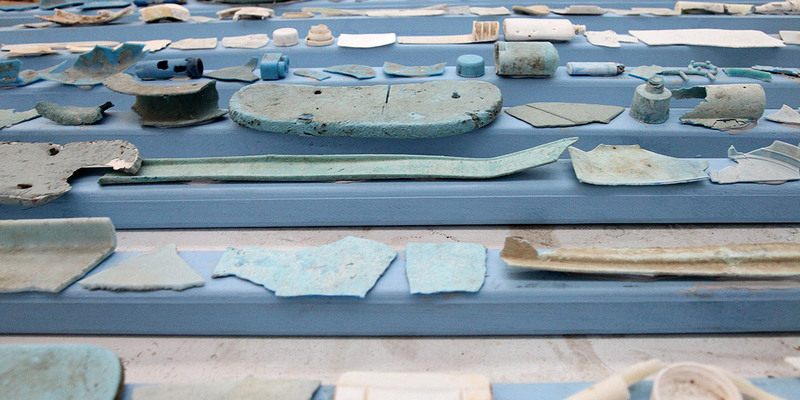 'Washed Ashore' is both a reminder of the extraordinary amount of waste, primarily plastic waste that now floats in all of our oceans and a positive encouragement that we can do something about it. 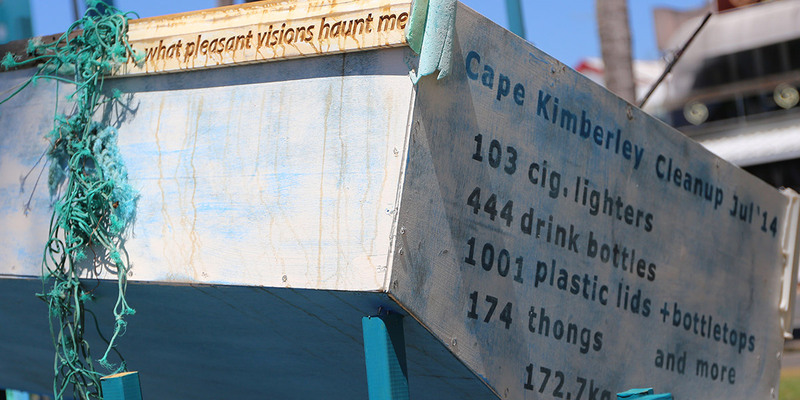 The message on the back of the boat shows how much waste has been reduced in Cape Kimberley over the years because volunteers from Tangaroa Blue, an Australia-wide marine debris clean-up organisation, are cleaning up the area on a regular (mostly twice yearly) basis. Volunteers from TB also helped to create the artwork. The use of blended colours mimics our initial attraction to products, which soon turns into waste/repulsion. It is also now understood that the massive pile up of garbage in the oceans currents (some of these twice as big as Texas, such as The Great Pacific Garbage Patch) breaks down to become micro particles that are consumed by plankton to become part of the food chain. In this way we are consuming our own plastic waste while changing forever the make-up of the natural environment. This work is an encouragement to do something positive about the situation. Each individuals actions create a powerful collective response, as can be seen by the work achieved by the organisation Tangaroa Blue. 1. http://en.wikipedia.org/wiki/Great_Pacific_Garbage_Patch The Eastern Garbage Patch has one of the highest levels of plastic particulate suspended in the upper water column. Unlike debris, which biodegrades, the photo-degraded plastic disintegrates into ever smaller pieces while remaining a polymer. This process continues down to the molecular level.